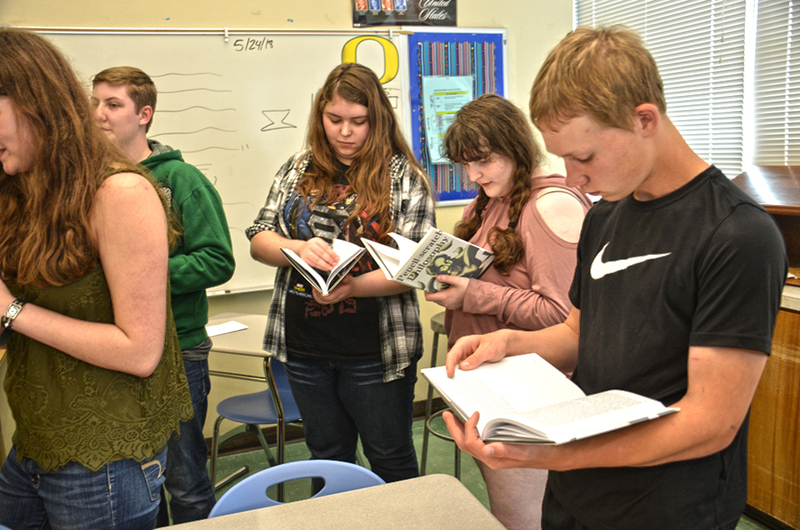 For three years Emma Snyder couldn’t wait to open the box and begin flipping through the pages of McNary Write Club’s latest book. Pencil-scratch Philosophy, the Write Club’s seventh and largest book yet, features work from 23 writers over 140 pages, concluding with Snyder’s poem Coin Collector. Snyder has been writing since middle school but back then her poems were always funny and quirky. The past four Write Club books are proof of Snyder’s progress. The book was also the final one for senior Parker Kehret, who submitted a poem, short story and film script. McNary junior Lauren Murphy has three pieces in the book, including the poem Dear Education. Along with new work by Write Club members Snyder, Kehret, Murphy, Anne Farris, Brooklyn Flint, Laura Gillespie, Michael Hitchcock, Hanna Lawson, Rose Nason and Adrien Weathers, the book also features contributions from the club’s writing contest winners Sara Arnsmeier, Ellie Auvinen, Eliana Berg, Paris Boyd, Hannah Eggert, Brady Ellis, Abrahan Garcia, Emily Lettenmaier, Layne Ling, Eben Mayer, Cade Olson, Natalia Smith and Raina Working. The front cover was designed by Lawson and the back by Farris. Paperback copies of the book are available at the Keizertimes office for $5.